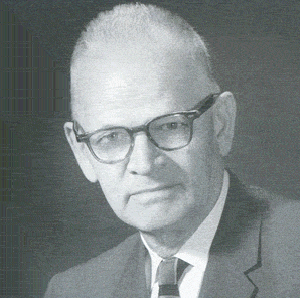 William L. White graduated from Auburn University on June 22, 1919. He had a dream to begin a national service organization for young business and professional men. White had the spirit and the initiative, but this young engineer and practical idealist lacked funding for such a major undertaking. What to do? Surprisingly enough, turpentine played a major role in this story. At that time the turpentine industry was centered in Valdosta, GA. The booming industry used turpentine cups to gather crude resin from long-leaf pines. The resin was then distilled to produce turpentine and rosin. After graduating, White lost no time in offering turpentine cups for sale. After selling two million turpentine cups, he put $1,000 into a revolving expansion fund. By May 18, 1922, White had enough money to form the first American Business Club in Birmingham, Alabama. Through the years members began shortening the name American Business Clubs to AMBUCS. In 1961, the name AMBUCS was approved for official use by the organization. 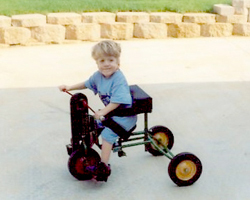 In the early 1990s Sue Haywood, a pediatric physical therapist in Texas, found herself constantly regretting how expensive adaptive tricycles are. She owned one tryke that she let each kid use for a week at a time. Sue saw a difference in strength, tone and self-confidence even in those short periods of use and wondered what great leaps her kids would make if each of them had access to a tricycle of their own. Sue expressed her frustration to members of the local Longview AMBUCS chapter. The tagline of National AMBUCS is Inspiring mobility & independence, so Sue was talking to exactly the right audience. Gene Allen, a member of the Longview chapter, quickly volunteered the use of his small fabrication shop. Soon many chapter members were regularly volunteering their time and skills to build trykes and give them, free of charge, to Sue’s kids. And then to other kids with special needs in their community. The project was both wildly successful and deeply moving. Each time another kid took their first ride, it solidified the chapter’s commitment—the outcome of their fundraising and volunteer efforts were now beautifully written across the faces of children. In 1995, the Longview chapter took their tryke project to the AMBUCS National Conference to share with the rest of the organization. The presentation was met with resounding applause and the membership voted to include the Amtryke Program as a nationwide project. It was a perfect fit. AMBUCS historically chooses to fill small but significant needs that go unfunded by government or insurance. Also, since its founding in 1922, AMBUCS has used the motto Shoulders Together to encapsulate its concept that great things can be accomplished when many members each give a small amount of their time and talents. The Amtryke program lends itself perfectly to both dynamics. Now there are around 5,000 AMBUCS members, in over 160 chapters, serving in more than 35 states. 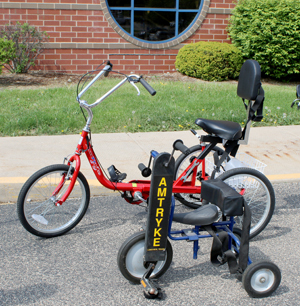 Nearly every chapter chooses to carry out the mission, at least in part, by providing Amtryke adaptive tricycles to people in their community. This grassroots approach gives the needed personal touch to putting amazing riders on very specialized trykes. It also gives each AMBUCS member a direct and profoundly rewarding link to the person benefiting from their time and effort. A Physical Therapist inspired the Amtryke project and today Physical and Occupational Therapists still play a vital role. Each chapter works with local therapists, who identify children that would benefit from an adaptive tryke and make sure those children are correctly and safely fitted to the best Amtryke for them. Many therapists become chapter members and many chapters are formed with therapists at the core. 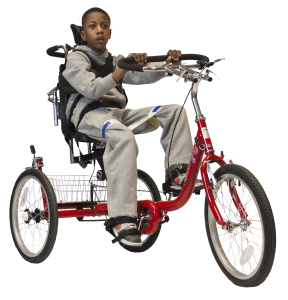 To-date, AMBUCS has provided more than 30,000 Amtrykes to people challenged with mobility and independence across America. The Longview chapter’s first tryke has proliferated into more than 15 models, each with a myriad of adaptation choices that truly make it possible for nearly everyone to experience the fun and freedom of riding, regardless of ability—from age two to 102!